Humour and Exaggeration: Can therapy be fun? Steve Wells well known for his work using Provocative Energy Therapy has kindly written this blog about the use of humour in therapy. Do we really have to be serious to create powerful change? I’ll let Steve answer that. Here’s an interesting question for you: If this (our work) is about Emotional Freedom, why is everybody so darn GRIM? 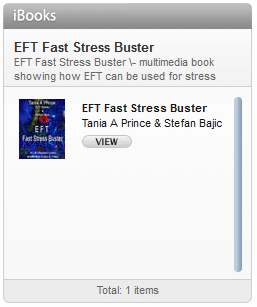 Everywhere I look I see EFT practitioners who are so very serious about their work. Not just the subject of their work, but the way they go about it. Now I agree we’re doing serious work, but come on people! Where is the lightness? Where’s the humour? Where’s the fun? Milton Erickson said clients have enough serious problems, the last thing they need is serious therapy! But fun has been outlawed by most professions and is not seen as part of good practice. In fact, they believe if you or the client are having fun, then you are doing it wrong! (We, on the other hand, believe if you are NOT having fun, you must be doing something wrong!). Dr. Lawrence Kubie, a highly respected psychoanalyst, condemned all use of humour in psychotherapy as inevitably destructive. He argued that, among other things, humour could lead to doubts about the therapist’s seriousness, act as a defense against the client’s anxieties, and blunt the vigilance of self-observing mechanisms. Now wouldn’t that be horrible? Contrary to Kubie’s beliefs, those who have studied humour (and virtually everyone who experiences it) find it helps. Robin Haig, in his studies on humour, found 96% of clients felt better if they saw a humorous side to their problem, whilst 94% found humour helped if they were “feeling down”. Now we know you, Tania, use humour, because it comes through in your articles and descriptions of work with clients. 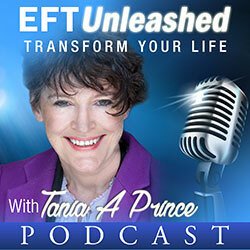 Techniques like metaphor and reframing help people to gain new perspectives and add to the artistry of what you can achieve with EFT. We do the same with our own Provocative Energy Techniques (PET) where we humorously encourage people to keep their problems whilst having them tap on the emotional consequences of that! Surprisingly, this bypasses their internal resistance against change, gets right to the emotional heart of the problem, creates perspective, puts them in touch with their personal power, and gives them an injection of humour and light. It’s enjoyable for both client and practitioner. And here’s the key: It validates them! Once you’ve had your problem validated in all its awfulness and terribleness, this promotes a powerful force for positive change. We also tend to exaggerate problems quite a bit, because we know that – as a famous cartoonist once said – only by exaggeration can people SEE the truth! Exaggeration is something you can do for your own problems, some of them anyway. In fact, here’s a test: If you can’t exaggerate the problem, it is probably too big for self-help. Go directly to therapy, do not pass go (except to collect £200 on the way so you can PAY the therapist!). Now, with that disclaimer, start here: Think of a problem and exaggerate it as you tap. Pretend that it is 10x worse than it really is and imagine that the consequences will be 10x worse. Really get into it as you keep on tapping. Tell yourself how terrible you are for having this problem. Tap on, “I’m a terrible person for having this problem and I’ll NEVER accept myself!” Have fun with this, but also ensure you are exaggerating the actual energy of the problem itself. If you are not getting relief, blow the problem out more and keep tapping until you do. If no relief comes forthwith, you have lost your sense of humour. NOTHING is worth that. Seek a therapist who can handle your serious stuff without losing their light energy and stick with them until you get your humour mojo back. Or come to our workshop, where we’ll teach you how to turn tears into laughter and lighten up your life – and the lives of those you choose to help. Well Steve, I am still working out how to use my blog properly. As to therapy, I especially like exaggerating issues to the point of it being ridiculous, I find it works really well and lends itself to both client and therapist having alot of fun in the session. Picking up on the unconscious communication that the client is giving out. Well thanks again for writing a guest blog, and I do agree that successful therapy can have a lot of humour in it. When i first came on your training courses (oct 02) – i was amazed that -possibly even shocked- that you could have so much fun and laughter and still be therapeutic! Not having a therapy background i presumed that any psychotherapeutic method MUST be serious! But you blew that one out the water for me! In a sense these type of beliefs represent black and white thinking – or even our ‘writng on our walls’ about what we think it means to bring about therapeutic change. I’m not suggetsing that we all have to start doing eft like Frank Carson, or Billy Connelly – but you have been a great role model for the shift in my development and application of eft -Thankyou for that. 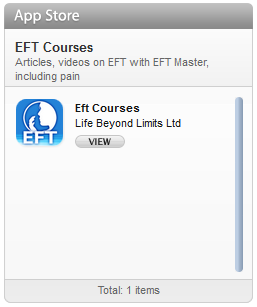 i love the work steve wells/david lake are doing bridging eft and provocative therapy. Humour can even work without EFT -as a personal example – i have been divorced for a number of years now and when i had first splitfrom my ex-partner i bumped into a friend i had not seen for a while. He asked how i was doing and because i was feeling sorry for myself (pre-eft!) -i said; ‘not very good – my wife has run off with my mate’! to which he replied: ‘i bet you really miss HIM -don’t you! Well i stood there, in a shocked trance-like state -as i could not process his comment – (it was like a scene from a cowboy film where he rides into a ghost town with the wind blowing and the tumble weed and everything!) – he then broke my trance by saying – ‘mike, i was only joking!’ . that was a great lesson in pattern-interruption and whilst i could not laugh at the time – it is my reframe that i use now: ‘my wife ran-off with my mate – i wish she would bring him back i really miss him’!! So the appropriate use of fun and humour – provided it well intended and respectful (sort-of! -you never know!) and done with great rapport can bring about amazing changes for clients – and as you taught me Tania -lightens up our work ! Wow, I was laughing my head off reading that, Mike. NLP pattern interrupts are fantastic. That is just such a funny story. I actually interviewed Steve over the phone about humour in therapy I’m going to add it to the blog. We had a chat pre-talk and post talk, that was really funny. Steve has a well refined sense of humour.